Our Solo Solid Shag Collection features luxurious shag rugs in 22 (count ‘em!) gorgeous colors. Lush and soft, you’ll fall in love with this amazing rug. Imagine sinking your bare feet into the lavish pile of this extravagant rug! You’ll be the envy of everyone who visits your home with the magnificent color from your Solo Solid Shag rug. Made in Turkey, this Unique Loom Solo Solid Shag Collection rug is made of Polypropylene. This rug is easy-to-clean, stain resistant, and does not shed. 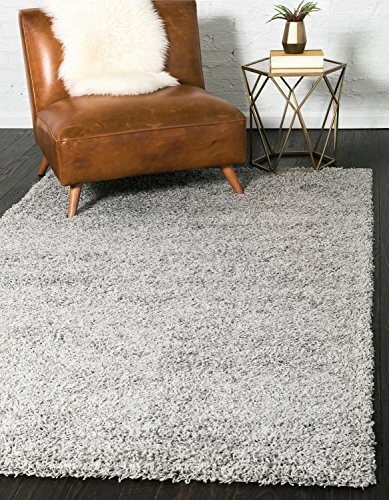 Colors found in this rug include: Cloud Gray. The primary color is Cloud Gray. The measurements for this rug are: 4 feet wide by 6 feet long. Home Dynamix Royalty Clover Area Rug | Transitional Living Room Rug | Timeless Geometric Design | Neutral Colors | Brown, Blue, Beige 5'2" x 7'2"